Turn your key, be idle free! For over six years, Salt Lake City and its partners have promoted the voluntary Idle Free Utah campaign in schools across the valley and in every corner of the state. The campaign reminds parents to eliminate vehicle idling in school pick up zones to prevent the unhealthy buildup of air pollution in an area heavily trafficked by children. Pollution Prevention Awards Due Tomorrow! The Utah Pollution Prevention (P2) Association is requesting nominations for the 2013 Outstanding Achievement in Pollution Prevention Awards. Large Businesses or Industry, Small Businesses or Industry, and Community Involvement Programs are eligible. Special consideration will be given to businesses or organizations demonstrating Collaboration with other businesses and organizations, Employee Involvement, and Innovation and Initiation of New Programs. These awards recognize the outstanding efforts of businesses whose practices reduce risk to Utah’s environment and to public health. To be considered organization must be able to demonstrate excellence in pollution prevention practices for the calendar year 2012. Reductions can be achieved through practices, projects or activities that reduce pollution at the source or remove materials from the waste cycle. Pollution prevention avoids transferring waste from one environmental medium (air, land, water) to another. Treating existing waste, installing equipment to comply with pollution control regulations, and energy recovery are not considered pollution and will not be considered for this award. Projects that focus on the environmental benefits of a product or service are not eligible. For Rules, a Nomination Form, and Previous Winners, visit the P2 Web Site. Projects must reduce waste generation, pollutant emissions or other releases at the source; recycle materials or conserve water or energy. Nominated program should use sound technology, be innovative and cost effective. Environmental benefits should be demonstrated. Applicant’s efforts, both inside and outside their organization, should promote pollution prevention as the preferred approach to protecting the environment and human health. Measurable progress should have occurred during the calendar year of 2012. Efforts should be able to serve as a model for other programs. Efforts should be taken voluntarily (in advance of regulatory requirements), but can be an innovative response to regulatory programs. Nominees should have a good overall environmental compliance record for two years prior to the nomination deadline. All nominees should submit a cover sheet, a one-page summary, and a narrative description. Optional supporting documentation, including charts, photographs, news clippings, news releases, publications, or other material may be included. Name, title, organization, address, and telephone number(s) of the person/organization submitting the nomination (if not self-nominated, please be sure to notify the nominee). A one-page overview of activities including dates when achievements occurred. Pollution prevention efforts, quantitative results of efforts, technological or managerial innovations, employee involvement, financial impact on operations, and costs and benefits (financial or otherwise). But don't let the blue skies fool you -- our valley faces air pollution challenges in the summer months, too. Ozone pollution, a different kind of pollution than our wintertime particulates (PM2.5), forms through a chemical reaction when heat and sun combine with emissions. It can aggravate asthma and impact heart and lung health. Cuts Carbon Pollution in America. In 2012, U.S. carbon pollution from the energy sector fell to the lowest level in two decades even as the economy continued to grow. To build on this progress, the Obama Administration is putting in place tough new rules to cut carbon pollution—just like we have for other toxins like mercury and arsenic —so we protect the health of our children and move our economy toward American-made clean energy sources that will create good jobs and lower home energy bills. Prepares the United States for the Impacts of Climate Change. Even as we take new steps to cut carbon pollution, we must also prepare for the impacts of a changing climate that are already being felt across the country. Lead International Efforts to Address Global Climate Change. Just as no country is immune from the impacts of climate change, no country can meet this challenge alone. That is why it is imperative for the United States to couple action at home with leadership internationally. America must help forge a truly global solution to this global challenge by galvanizing international action to significantly reduce emissions, prepare for climate impacts, and drive progress through the international negotiations. Read the full Climate Action Plan to get all of the details (PDF). Join the conversation on Twitter with the #ActOnClimate hashtag. 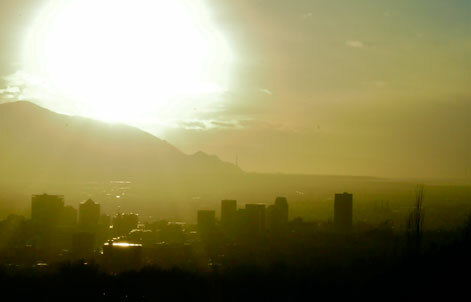 Air quality is a hot topic for residents living in Salt Lake City and along the Wasatch Front. It’s no surprise, really. With more than 22 RED air quality days on the calendar so far this year, it’s easy to count the days our air quality has been GREEN on your fingers. Learn more about winter inversions – what they are and what we can all do. Salt Lake City is committed to improving our air quality, and is aggressively working to reduce vehicle emissions and improve air quality through programs that conserve electricity and natural gas, encourage individuals to drive down their personal motor vehicle miles and reduce other sources of air pollution. Learn more about what Salt Lake City is doing to help improve air quality. One of the largest contributors to our air pollution is motor vehicle emissions. This is both a challenge and an opportunity. The opportunity is for residents to take simple but important actions to reduce their vehicle trips and miles. The challenge is speaks for itself. Learn more about driving less and other green transportation options. In addition to implementing an Idle Free Ordinance, Salt Lake City is working on new strategies that will result in real, measurable improvements in the air quality. Stay tuned for more developments. View current air quality conditions in Salt Lake City.